Commercial Property: As Safe as Houses? Home Our BlogCommercial Property: As Safe as Houses? By now you may have seen news headlines about property fund net asset values being reduced accompanied by a flurry of retail and institutional investor selling out of those funds. The scale of redemptions means a number of prominent property fund managers have to suspend trading activity to avoid running out of near term cash. They generally hold cash to allow investors to exit smoothly and to avoid being forced sellers of properties. From our perspective, there are two opposing and important issues to understand about property. On the one hand, property does have positive fundamental attributes. Asset prices benefit from rising tenant rents and the income generated from these properties and paid to investors is attractive in today’s world of low interest rates (see figure 1). On the other hand, it is well-known that property lacks liquidity and fund expenses can be high particularly when compared to more broadly diversified multi-asset funds. The liquidity point is particularly pertinent for funds with open-ended structures as investors expect to get their money back quickly, and when needed. Our strategy funds have very low exposure to property but this does not mean that property is a no go area, it just means that the higher costs and potential lack of liquidity are considerations that have to be properly taken into account. The reasons of liquidity and cost cited here are the reasons for the limited exposure to property across our multi-asset funds. In the below table we show what exposure our Managed Portfolio Series has to property. As you can see we have low exposure. The majority of our property exposure comes from the True Potential Allianz funds and True Potential 7IM funds. It is worth noting that 7IM and Allianz do not own open-ended physical property funds as they are not permitted to hold this type of property under UCITS because of the liquidity and risks they entail. Their exposure is largely through global listed real estate companies including REITs (Real Estate Investment Trusts) or Exchange Trade Funds. These instruments do not share the same liquidity characteristics as the funds that you may have read about in the news over the past few days. We are often asked why we don’t have a specialist property related strategy fund within our portfolios when, on the face of it, property returns have beaten both UK equities and bonds. This has galvanised recent opinion in favour of property but for many, the excess return that has materialised seemed disconnected from fundamentals. From a fundamental perspective it seems likely that a portion of the recent five-year historic excess return over other risk assets, like equities, has been driven by retail and institutional investor desire for income. This has put exceptional money flows into property funds, which is illustrated by the data from Investment Association which shows £9 billion of inflows into property over the past five years attracted by yields typically in excess of 3%. 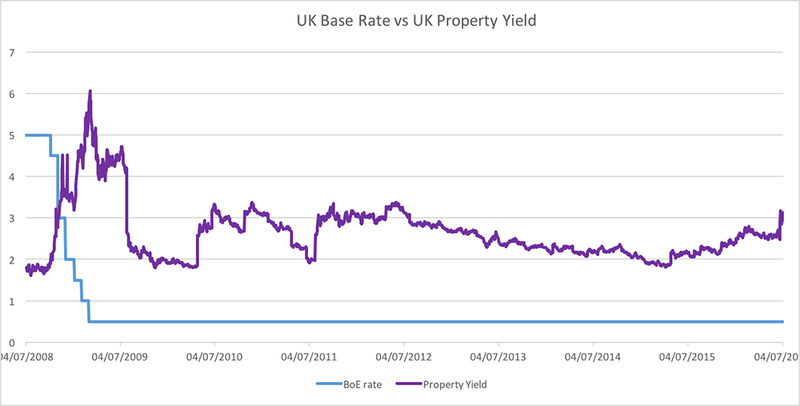 Now that we are seeing a reversal of trend flows, it is causing investors to question whether or not property is the place to park money in a post-Brexit world. Furthermore, it is ironic that regulators have been fixated on potential lack of liquidity in the fixed-income corporate and emerging market bond arenas whereas it is the ‘UK property horse’ that has bolted. Although there are still grounds for being positive longer-term on good quality property with good tenants, near term considerations surrounding Brexit have started a reversal that is proving difficult to handle when single-asset and open-ended fund structures are ill suited to meeting investor liquidity demands. Property funds with lower quality assets that are tomorrow’s forced sellers will pay a heavy price, or should we say it is the unfortunate retail investors in those funds that will pay the penalty. The deeper message is that diversification not only mitigates volatility it provides much greater flexible access to capital at times when it is most needed. We cannot always judge when this will happen so it is best to be prepared for the worst and ensure that future performance and liquidity requirements are properly balanced. When looking at any investment proposition ask yourself this question, ‘what is being transformed to deliver the outcome?’. Direct property funds attempts to transform liquidity has shown that liquidity risk is difficult to quell, and when it goes wrong the client suffers. Funds that smooth returns promise to completely transform volatility whereas multi-asset funds seek to mitigate volatility. A question to consider would be what if smoothing stops working?